Nell Falatek knew she needed help. She could not read at all. She could sign her name to checks — out of habit — but she could not see her signature. Nell, who lives in nearby Dravosburg, probably will not drive again. 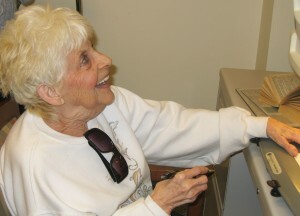 But thanks to Blind and Vision Rehabilitation Services of Pittsburgh (BVRS) and to her close friend Elaine Jones, Nell Falatek is now able to read again. Nell, who has three children, worked for 30 years as a unit secretary at McKeesport Hospital. She’s been retired now for 16 years. At BVRS, Nell was seen by our optometrist, Dr. Erica Hacker, for a low vision evaluation late last year. Macular degeneration is the cause of Nell’s vision loss. While here, she evaluated a variety of low vision devices for reading and completing daily activities, and our occupational therapist, Melynda Gradich, trained her to use these devices independently. The devices Nell selected include: a magnifying mirror for grooming; reading stand to hold books and magazines; a small powerful magnifier for reading; bump dots for her microwave dials; telescopes for distance television viewing; and a CCTV for sustained reading. A few weeks after her evaluation at BVRS, Nell called to tell us she was able to read a book with the training and devices she received from us.